The effort to excel in watch-making wasn’t something that came out of compulsion to me. It had always been something that I nurtured with great love and a greater effort to understand the intricacies and mechanisms of chronometry. Being a constant vigilant of the ever-changing technological game-play in the arena of watch-making, I’ve definitely come across some of the best and the worst. But what has struck me the most is the sheer brilliance of ideas coming from equally incredible minds that achieved the most remarkable balance of form and design. And one such immensely impactful balance of the essential elements of chronometry has been achieved by August Steiner, a brand that deals in the creation of perfectly personalized statements for every wrist it goes on. Hey, I’m Raymond Coger, and I’m a watchmaker who studies the developing styles of chronometry of recent times, up-close and personal. 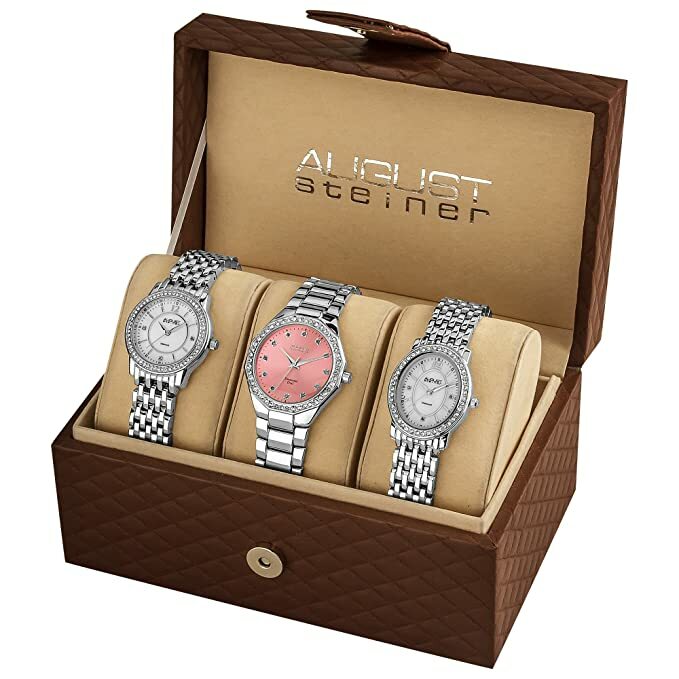 And today, I’ll be walking you through the August Steiner line of watches to tell you what’s in store for everyone! Established in 2006, August Steiner specializes in creating the perfect balance between style, functionality, and versatility. 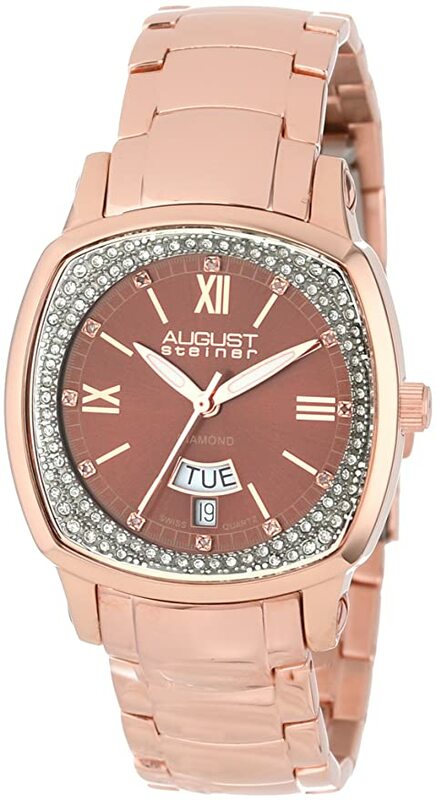 August Steiner imports quartz from Switzerland that is reflected in the monogrammed “Swiss Quartz” dial. The movements are obtained from Japan which are then assembled in China. This lets the brand create a line that is affordable, incredibly durable and stunningly balanced between a contemporary and classic facade. The range opens up stunning collections for both men and women for carving out an individual style. And a tremendous versatility of form and structure make each one of these watches a befitting companion for every occasion. An essential and greatly admirable aspect of the August Steiner watches is the cohesive look it brings to any kind of style statement. No matter what you’re wearing, these watches are going to blend the seams out on every style effortlessly. I first came across this brand while checking out some of the online portals dealing with new launches in the market. I was able to tell one vital thing, and that was the manufacturer’s knowledge and understanding of structural integrity. Well, although I did wait for a few days keeping a tab on the reviews, I was confident of the brand’s quality and performance. 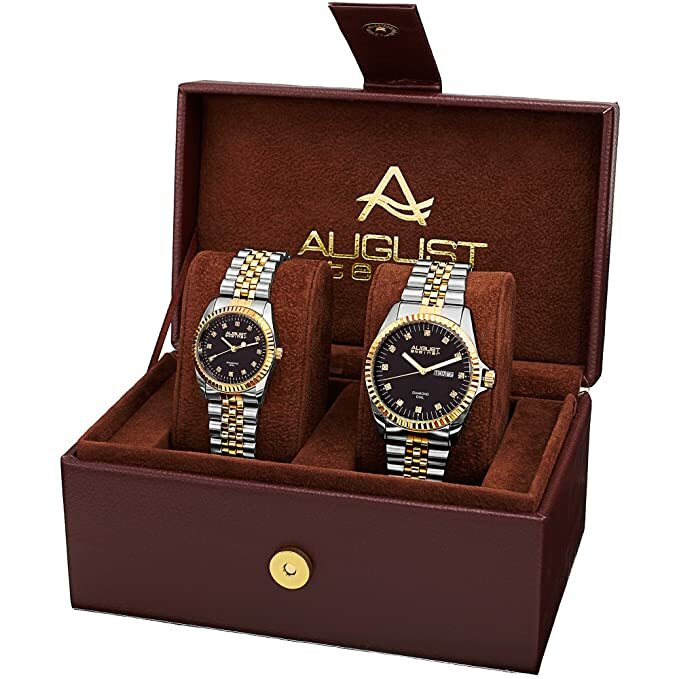 I currently possess two men’s watches from the brand, and both are analog models. 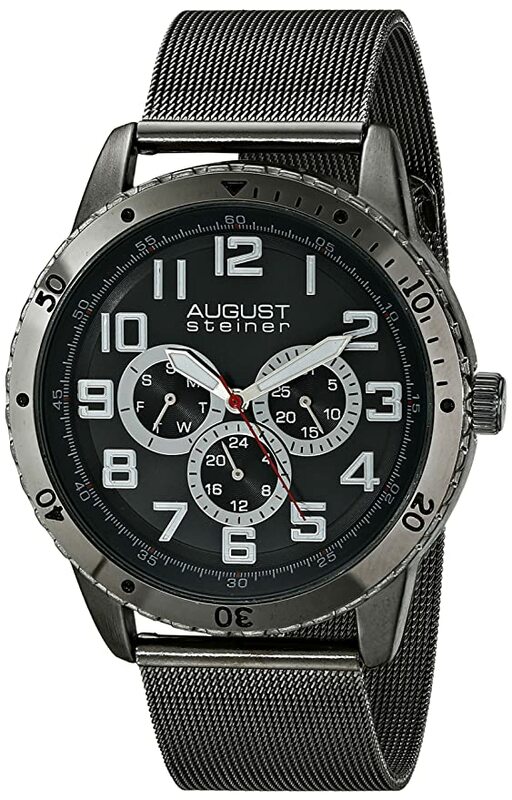 The first one that I bought for myself was the August Steiner Men’s AS8115BK. 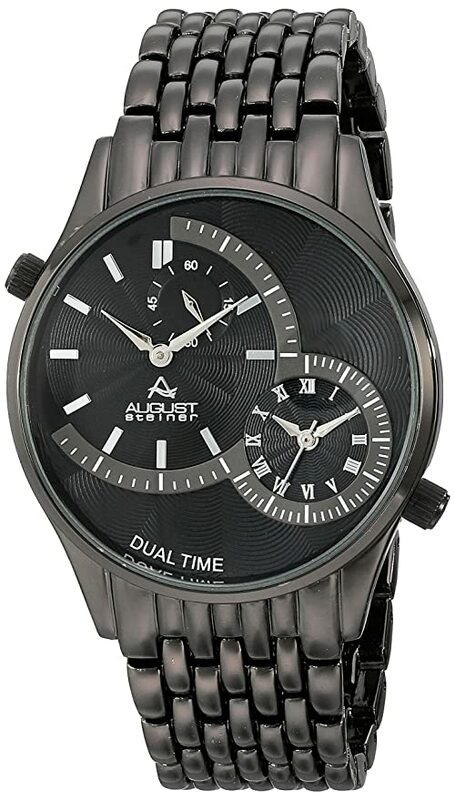 This one’s a magnificent timepiece from the brand that brings an eclectic blend of the elegantly formal and boyishly casual charm in its design. Constructed out of black stainless steel, the watch possesses a round case measuring 45 mm in diameter and 11 mm in overall thickness. 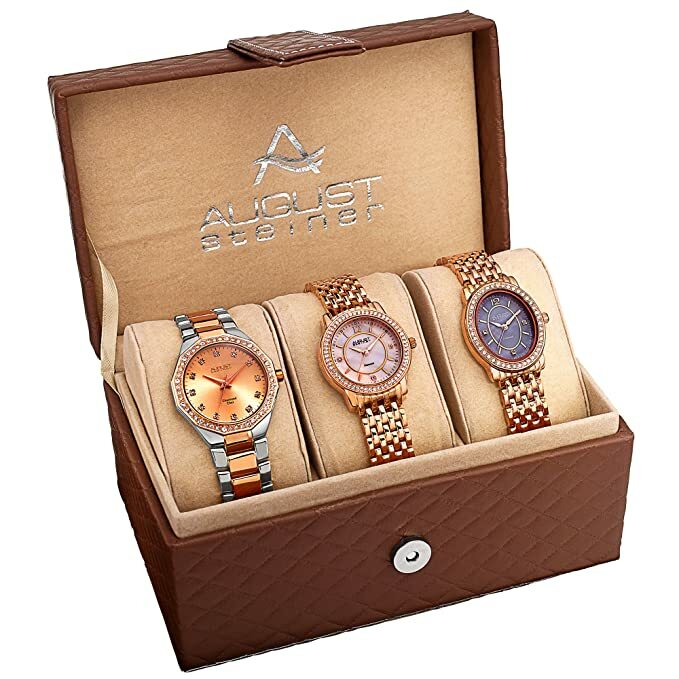 It comes with a stainless steel band with an uncomplicated buckle closure which makes for comfortable and secure wear. Now, one of the things I really liked about the watch is the finish. The watch comes with the brand’s signature mineral finish that makes it exceptionally weather-resistant and chip-resistant. The three overlapping subdials for the day and date give the watch a stunningly dignified appeal. Although the overall design inclines heavily on a very suave professional look, it brings all of the brilliance of a spirited, carefree persona when paired with any casual attire. One other aspect I do have to mention is that the watch gives you the benefit of luminous hands as well as markers on its face for easy visibility in the dark. The only thing that could have been a tad bit better, in my opinion, is the level of water resistance it offers. It just goes up to 99 feet, so I wouldn’t advise you to go scuba diving with it. The second one that I bought from this brand is the August Steiner Men’s AS8141BK, which is actually a part of my regular wear and I do put this on my wrist quite often. The thing that got me hooked on to this watch was its astonishingly unconventional design that goes against all rules of a regular analog. The watch is made of black metal and comes with a case diameter of 42 mm and a thickness of 11 mm. Along with this, it possesses a 22 mm black metal band having a fold-over clasp and a “double-push button” mechanism that ensures complete safety. The main black dial has two somewhat ässymetrical overlapping sub-dials for dual-time display. And what I admire the most about this watch is that it runs on a classic Swiss Quartz movement, which delivers precision and efficient time-tracking throughout. The finish on the watch is a mineral one similar to the previously mentioned model. However, the water-resistance on this is even lower than the first model, having a mere 33 feet of resistance on it. This is the only thing that was disappointing to me about this model. One other thing that I missed is the luminous hands on the dial face for visibility in the dark. Yet, apart from that, this one really sits amongst my top favorite regular watches. So this was my review for the August Steiner brand of watches. Hope I was able to provide you with an insight into the mechanism of these chronometers. Will be back with more. AriaWearable.com is a participant in the Amazon Services LLC Associates Program, an affiliate advertising program designed to provide a means for us to earn fees by linking to Amazon.com and affiliated sites. Amazon and the Amazon logo are trademarks of Amazon.com, Inc. or its affiliates.